"When we’re finished with all this school business, you’d better come and join us. We export watches all over the world"
"... it provided an excellent opportunity to study the watch making industry closely and examine every type of watch produced both in Switzerland and abroad"
By 1903 Mr Wilsdorf had settled in London working for another watch making firm. After gaining experience from this and his previous employment and growing in self confidence he set about to established his own firm. With financial help from his brother-in-law, Alfred Davis, the company known as ‘Wilsdorf and Davis’ was founded. The firm did not initially produce wristwatches because wristwatches were not thought masculine by the public and also the technical difficulties that many watch makers believed existed in trying to make this type of timepiece. Such problems as the difficulty of producing a movement small enough to be housed in a case to be worn on the wrist and the likely hood of moisture and dust entering this case and thereby ruining movement were cited. However, unlike other producers of wristwatches, this was not to deter Mr Wilsdorf. 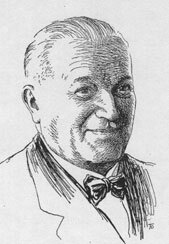 The first stumbling block was surmounted with the acquaintance of Hermann Aegler. While working in La Chaux-de-Fonds Mr Wilsdorf had come to hear of this gentlemen and his ability to produce rough movements that would be small and cheap enough to be used in the production of wristwatches. In 1905, Mr Wilsdorf, full of conviction of the possibilities of the wrist watch, placed an order worth several hundred thousand French Francs for these movements, an order which at this time was the largest ever booked. The second difficulty in producing this type of watch, a case impenetrable to moisture and dust, was not to be achieved for another twenty years. But, in the meantime, one of the major events in Rolex history occurred.
" 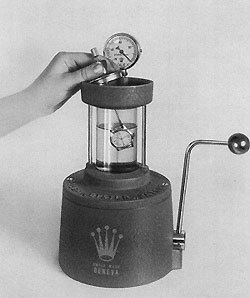 ... short, yet significant, not cumbersome on the dial (thus leaving room enough for the inscription of the English traders name) and above all a word easy enough to memorise, with a pleasant sound and have its pronunciation unchanged whatever European language it is spoken"
The picture shows the patented Rolex vacuum device, ref# 1000, used to test the waterproofness of an ‘Oyster’ case. The watch is immersed in the water and by expelling air a vacuum is created. If there are any leaks in the case, small air bubbles will be seen escaping and rising to the surface. However, using the manufactures trade name on the dial of a watch was going against the accepted practice of the time. Historically it was the importers name and not the manufactures that was displayed on the watch dial. It was to take time, money and a major technical innovation to break this tradition. 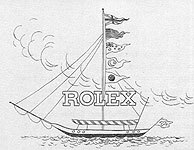 Initially Rolex were successful in having 1 watch in every 6 carrying their trade name, but by 1925 this had only increased to 3 in 6. Therefore tiring of the slow progress, Mr Wilsdorf took an enlightened step.
" ... a watch case so tight that our movements will be permanently guaranteed against damage caused by dust, perspiration, water, heat and cold. Only then will the perfect accuracy of the Rolex be secured." Finally, in 1926, this objective was achieved with the now patented ‘Oyster’ case, so known, as it was as impenetrable as an oyster! Although this invention was initially thought of with scepticism and took some notable events to break this thought, it is now a standard to which nearly all sports watches are measured. The last major innovation that was to create the basis for the Sports watch that we know this day took place 5 years later, in 1931. Up to this date, watches required winding by the wearer to give them the energy needed to function. The aim was to do away with this dependence and seek a system that would require no intervention by the wearer. The idea was not a new one, but it was Rolex that finally perfected and patented the Perpetual self winding mechanism. It operates by a semicircular rotor weight that pivots around its axis and winds the watch at the slightest movement of the wrist. Now the scene was set. Rolex were now producing a watch small enough to be worn on the wrist, impervious to outside elements and required no winding from the wearer; the Rolex Oyster Perpetual. Please note that the Author and this site are in no way affiliated with or related to The Rolex Watch Company Limited. All trademarked names, brands, models and designs mentioned herein are the sole property of The Rolex Watch Company Limited.